What does it mean when somebody gives you a packet of Habanero chillis? Especially if it is Special K, the sister of Commander J. Is she hoping I’ll think they are pepperdews and eat a couple before spontaneously combusting? Or does she think I’m so cool I can handle the heat? Perhaps it is because she thinks I am boring and in need of spicing up? Or does she just enjoy seeing a grown man cry? I am hoping that it is because she likes me and knows I’ll put them to good use while making a Splash. It did however set off a train of thought in my head about the concept of peppers. There are so many different kinds of peppers and the term is used to describe seeds (black pepper), husks (sechuan pepper) and fruit (capsicum). I seemed to recall that Eskimos have over 100 words for snow but on further online investigation this appears to be an urban legend (according to Wikipedia) and bears absolutely no relevance to this post. I am going to concentrate on the capsicum variety in this post and will come back to the seed/husk varieties at a later stage. For me the magic of a red pepper is revealed with the application of heat. Roasting peppers on an open flame transforms a slightly bitter, watery crunchy thing into a smoky, sweet sublime flavour burst with so many uses. They go well with cheese and cured meats. They can liven up a caesar salad, be made into hot or cold soups, added to hummus, eaten as a side dish, used as part of a roasted vegetable salad and the list goes on. I like to marinate them with a bit of red wine vinegar, olive oil, garlic and chopped parsley and keep them in a jar in the fridge to be used as and when required. I had some left over polenta wedges in the freezer on Monday and being a little fatigued after my fabulous but extensive Pilates workout at The Studio in Claremont, (my body is being reformed you see, on this slightly medieval but very effective machine called a reformer- Cardinal Ximinez eat your heart out) I decided to make a baked dish with polenta, roasted peppers, feta, fresh tomato, basil, chives and olives. You can add whatever you have leftover in the fridge (artichoke, chilli, asparagus, aubergine, avo etc) it is quick and it makes a great dish for Meat Free Monday. 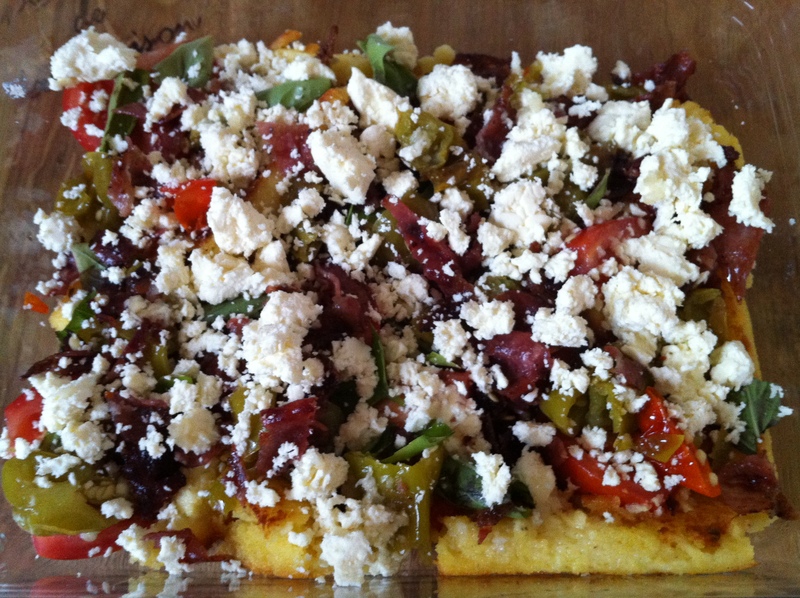 A loaf of bread, a polenta bake and thou with apologies to Omar Khayyam. 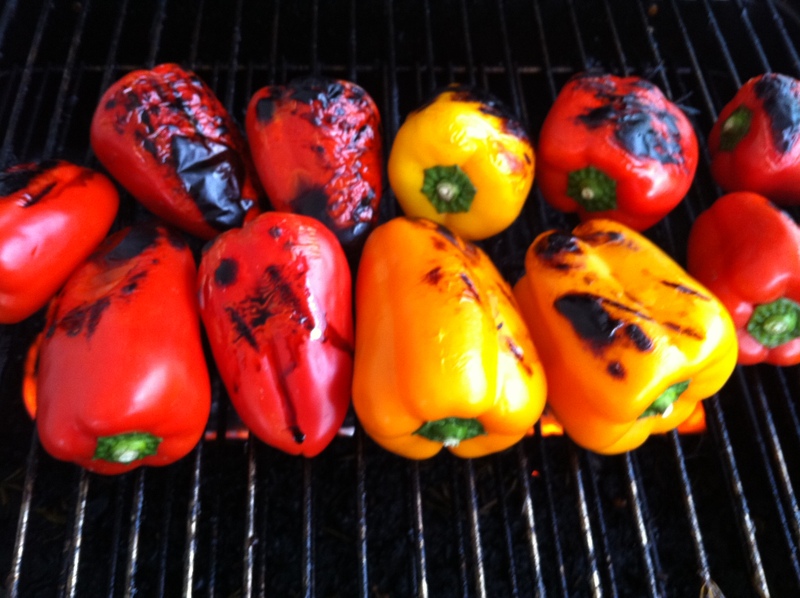 – Roast the whole peppers under a hot grill or over an open flame until the skins are blackened turning regularly. Place them in a 2 litre ice cream tub with the lid on and leave to cool. The steam from the peppers helps to lift the skin off and makes it easier to peel. Peel them but do not wash or rinse them as this will remove a lot of the flavour. – Deseed the peppers and cut into strips. They are now ready to be used but will be even better if marinaded overnight. 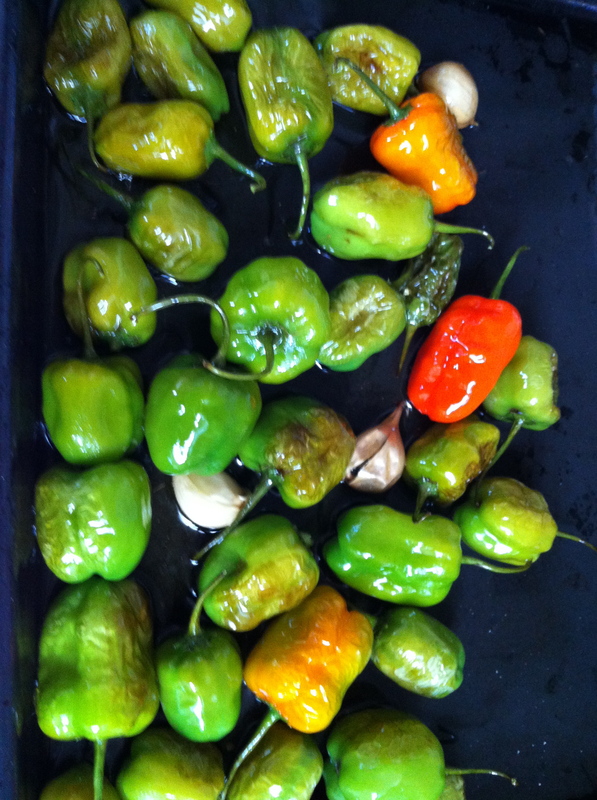 – You can also roast whole chillis (choose mild fleshy ones) with a clove of garlic and lots of olive oil. As soon as you take them out of the oven pour a good glug of balsamic into the pan but watch out for the sizzle and mix well. Don’t bother to peel or seed them just eat them as is or chop up for a roasted chilli sauce. They will last longer in the fridge than it takes to eat them. Dude, you KNOW habanero’s are welcome in my home anytime! Send surplus this way.